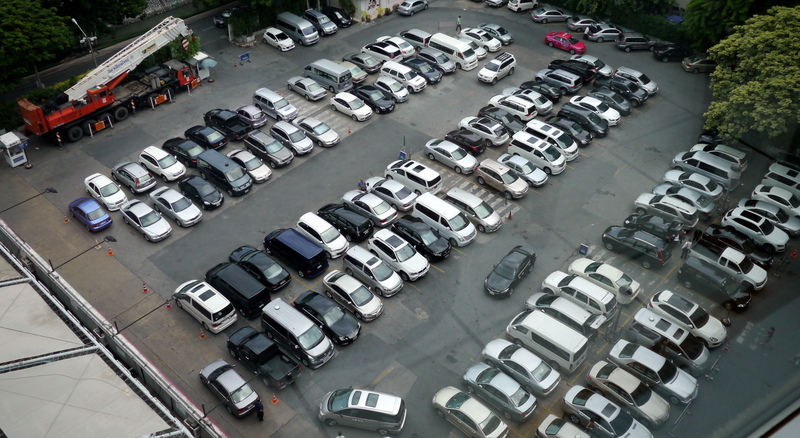 Living in Thailand, where English is taught in the schools but not very well, one encounters all sorts of examples of Thai English that provoke confusion, bewilderment, and hilarity. (Of course, being perfectly fair, my creative uses of the Thai language send normally polite and reserved locals into paroxysms of laughter.) The other day at a local mall, I stopped to admire the works of young artists who had created entries for an exhibit themed around environmental awareness. 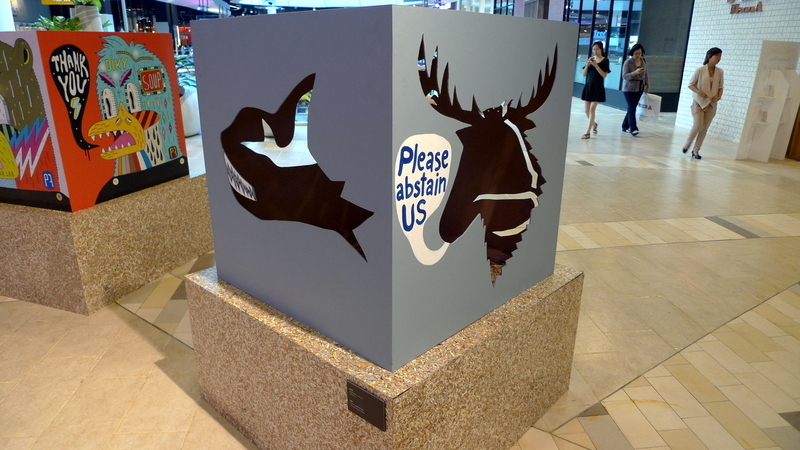 A painter offers this moose imploring viewers to “please abstain us”. The idea, according to the plaque on the base, was to not eat endangered species of animals. A thoughtful idea and a graphically arresting one, even if a bit off in its use of English. Not the first time I’ve written about Italian Sunday Gravy, the seminal slow-cooked tomato sauce filled with various cuts of meat. Shortly before leaving for the US, we visited a Swedish-Thai couple we know and prepared Italian Sunday Gravy for them and several other friends. 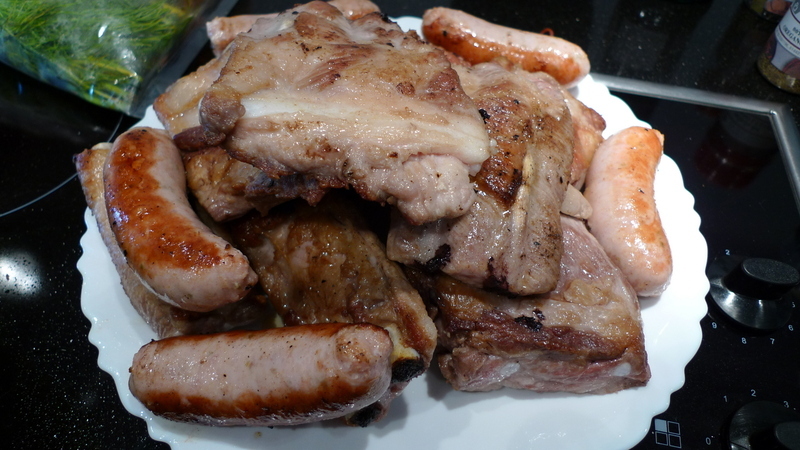 A plate full of meats – sausages, ribs, and loin – are seared to get some color into the pot. Then onions are sauteed, tomato sauce is caramelized, canned tomatoes are added, and then the meat is placed back in the sauce and the whole thing bakes in the oven for three hours. 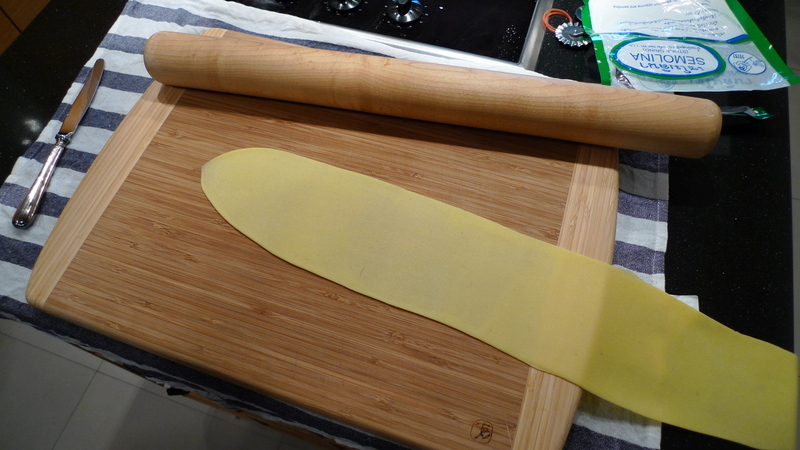 Meanwhile, I made some homemade pasta using Thomas Keller’s French Laundry pasta dough recipe. Since we were at friends’ house and I didn’t want to carry my KitchenAid mixer (which has a pasta rolling attachment) I just used a cutting board and rolling pin. A little more rustic, but it still turned out okay. 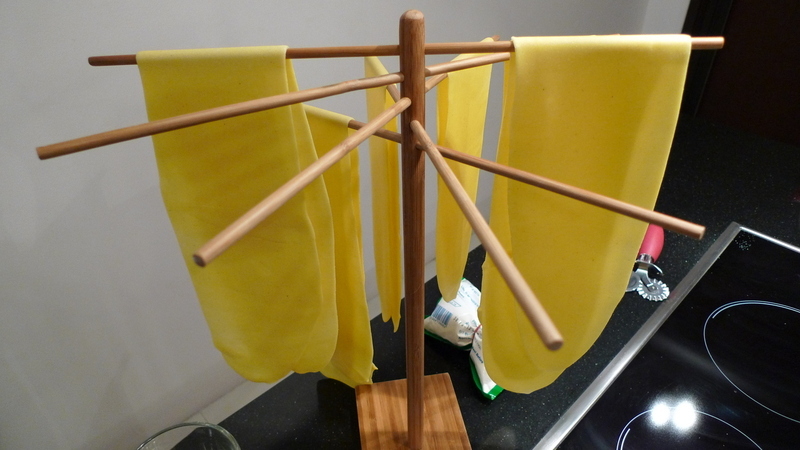 Letting the sheets of pasta dry for a few minutes before cutting them. This way, the individual pieces of pasta cut more easily. 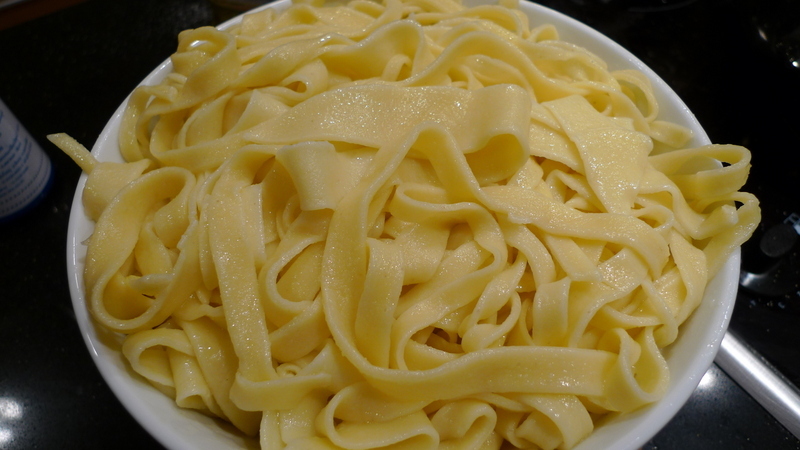 The hand-cut pasta – I didn’t have a ruler or straight edge handy so these are cut with all sorts of varying width. Very rustic, indeed! My technique (or lack thereof) would shame Italian grandmothers. Cook the pasta in salted boiling water just as the sauce is finished. 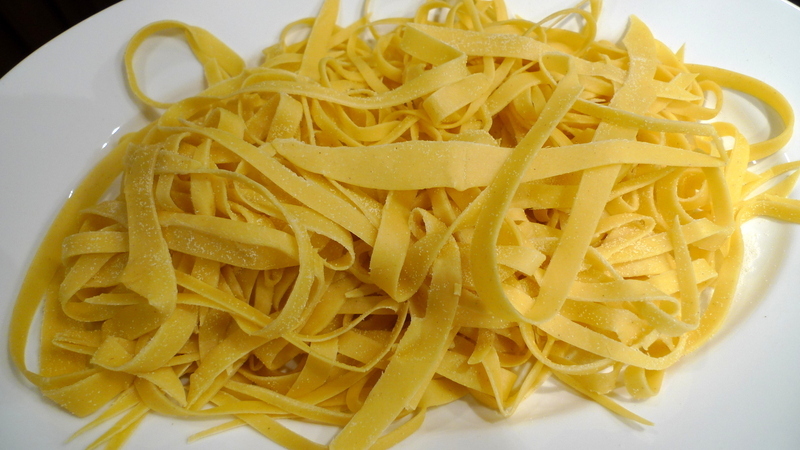 Fresh pasta cooks much more quickly than dried pasta so one needs to pay close attention. 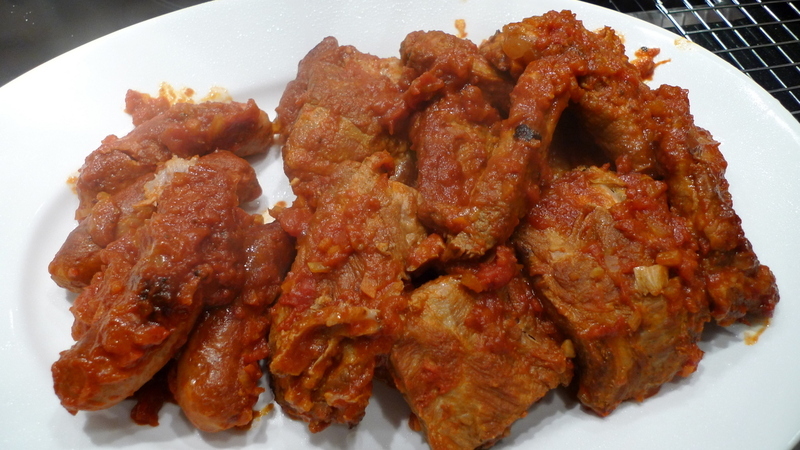 Once the meat is tender, you pull it out of the sauce and serve it on a platter. 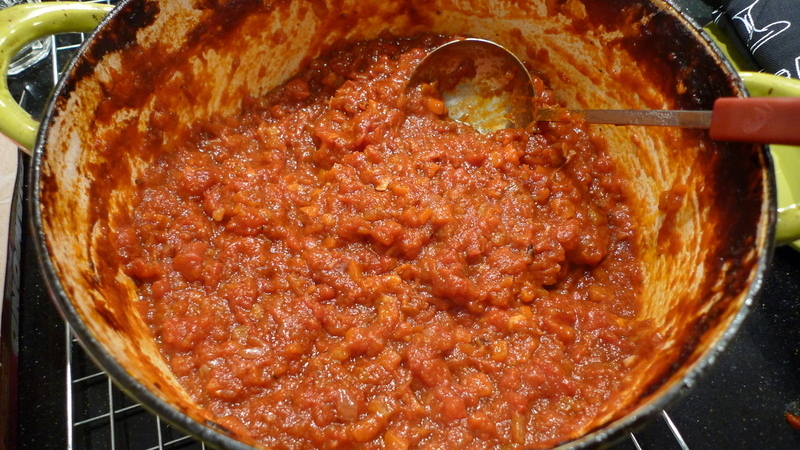 The remaining sauce is served directly from the pan and spooned over your pasta. Lots and lots of flavor in there! 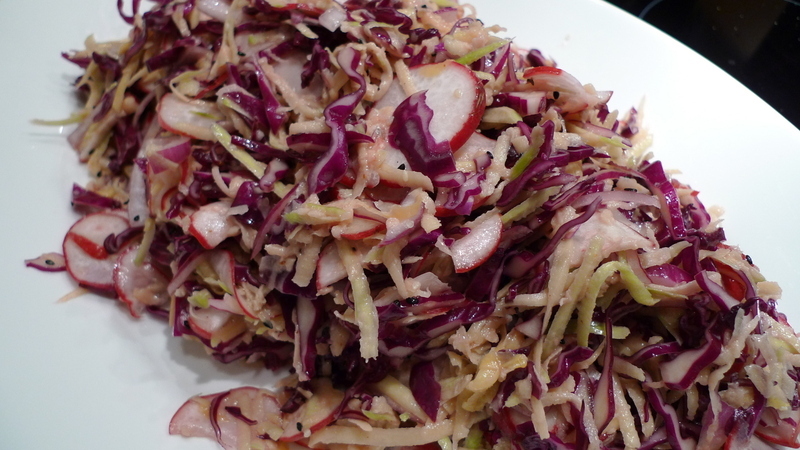 A side dish of cabbage, fennel and radish cole slaw with a sesame dressing. Makes a nice accompaniment to the heavy Sunday gravy. 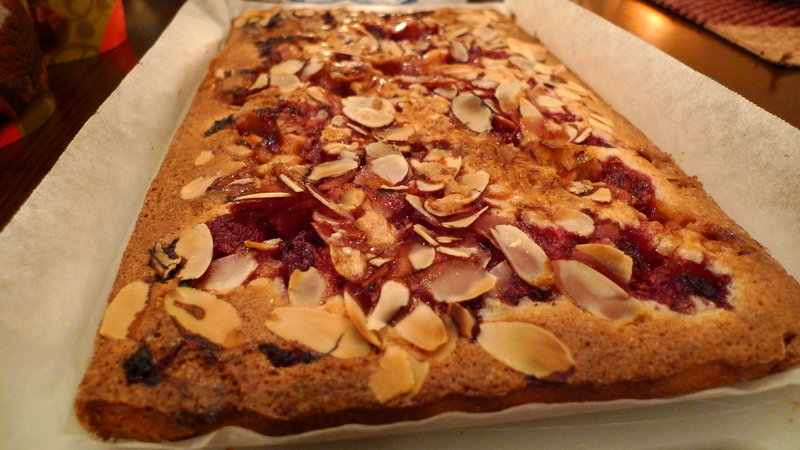 For dessert, one of our hosts cooked raspberry almond bars. These were fantastic. All in all, not only did we have a very fun time visiting with our friends, but the cooking was fun, too. 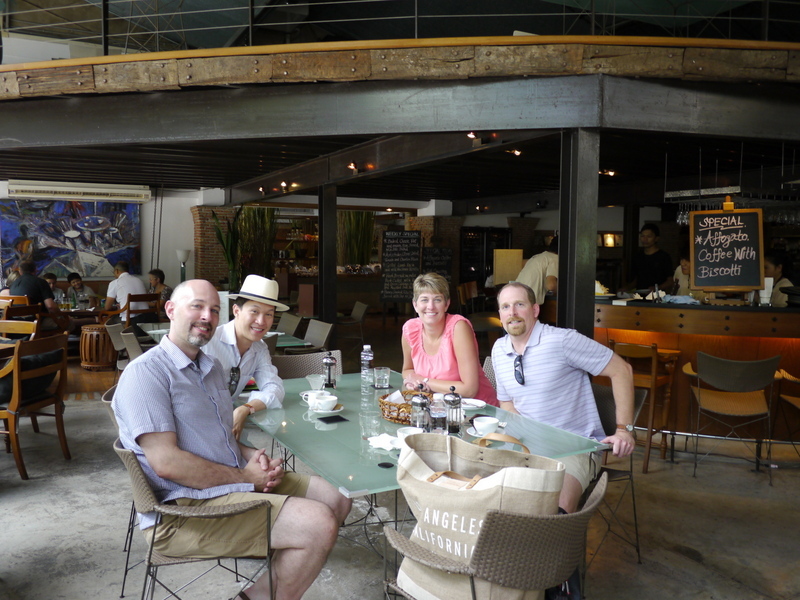 When Tawn and I flew back from the United States to Bangkok in June, my sister Jenn and brother-in-law Kevin made the trip with us. It was an adventure as they have traveled very little outside the United States and never before to Asia. 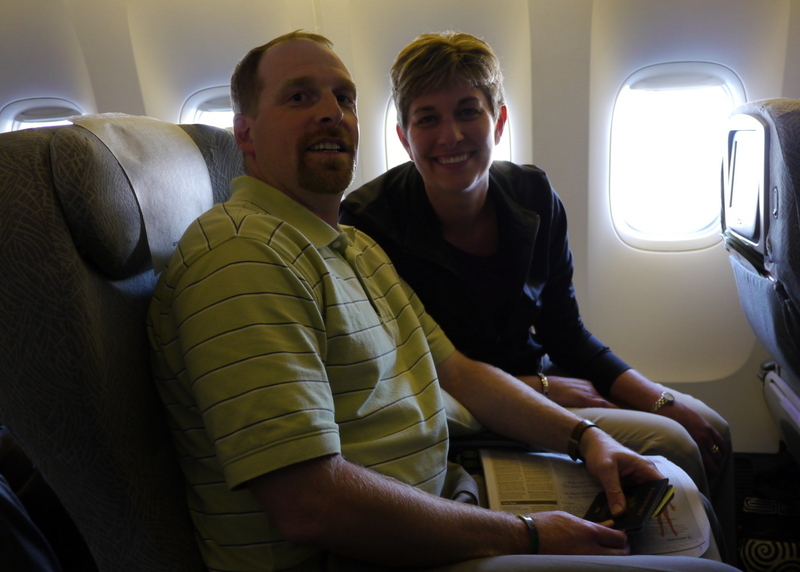 Thankfully, I was able to book seats on our same outbound flight and even arranged for seat assignments across the aisle from us. 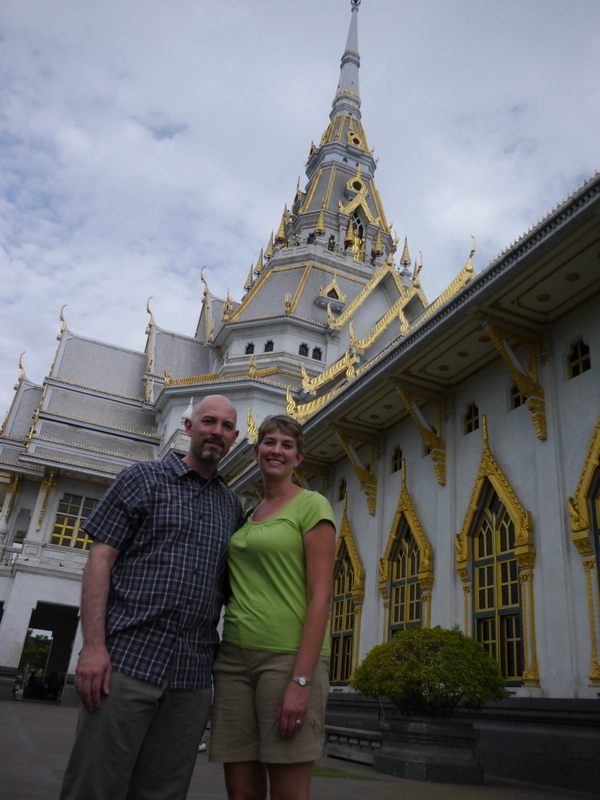 Jenn and Kevin were an adventurous pair, willingly trying new foods and having new experiences. Here, we venture out for a typical Thai breakfast of curries and stir-fries served with rice. 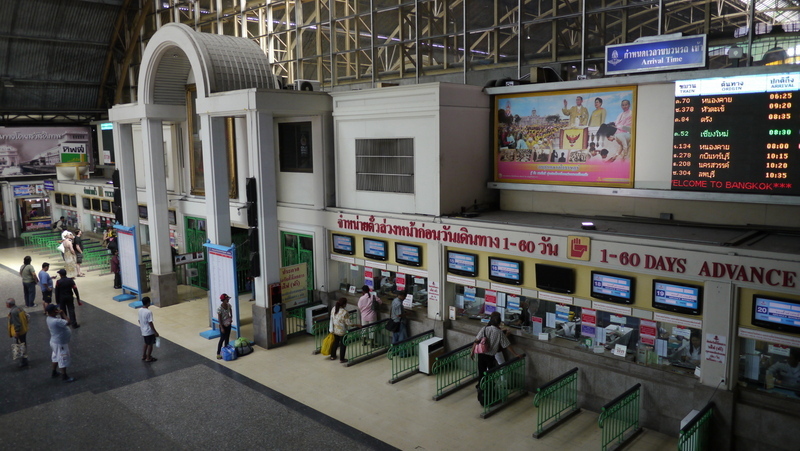 We spent one morning seeing another side of Bangkok, going to Hualamphong railway station and boarding the intercity train for a trip to the suburbs. Train cars in Thailand are antiques – most at least three decades old – and the third-class cars have no air conditioning. Definitely a different experience for visitors from the American midwest! 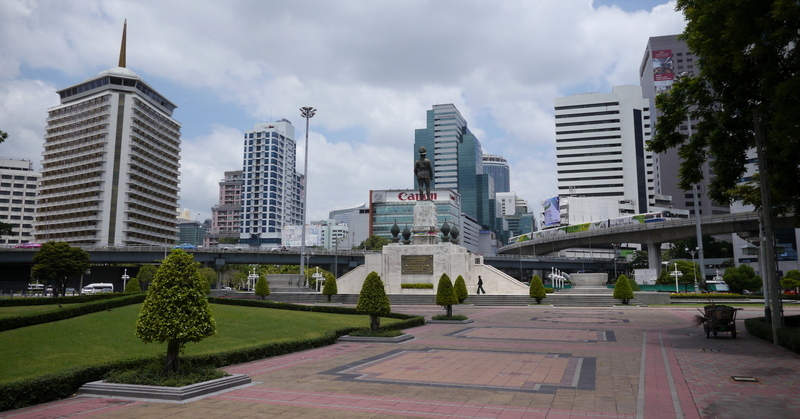 One morning, they took the Skytrain to Lumphini Park, the closest thing Bangkok has to a central park. 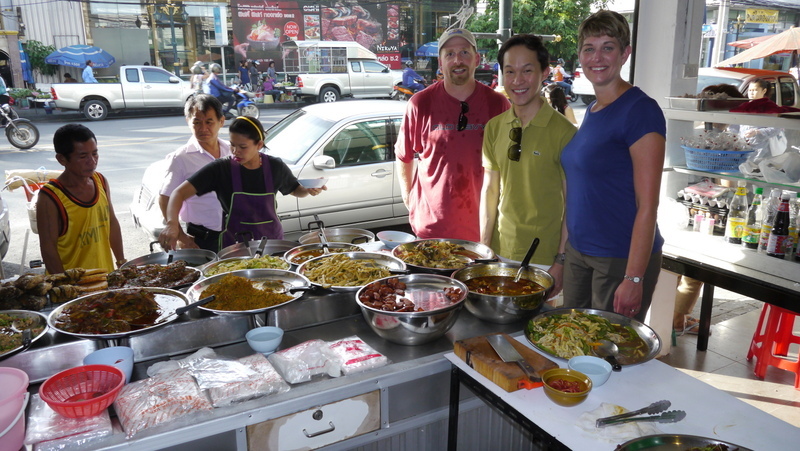 I met them there in the late morning and then we walked to a nearby Isaan style restaurant famous for its fried chicken. In the above picture, the Dusit Thani hotel is the one on the left with the spire. 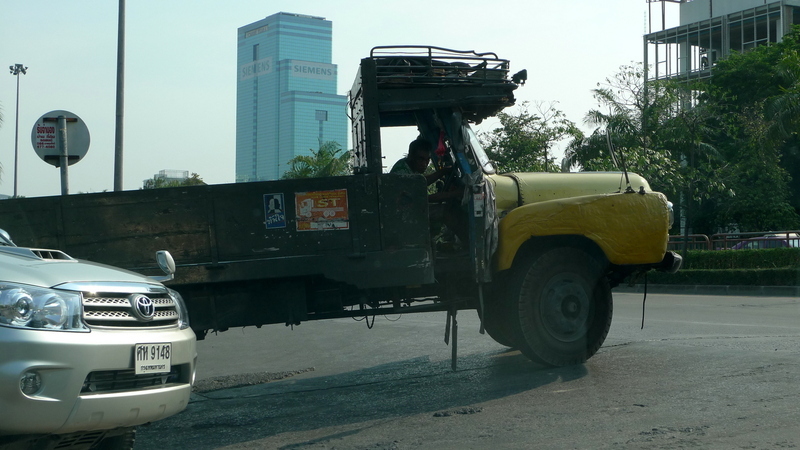 It was the first high-rise building in Bangkok. Another morning, we visited Wat Saket, also known as the Golden Mount. 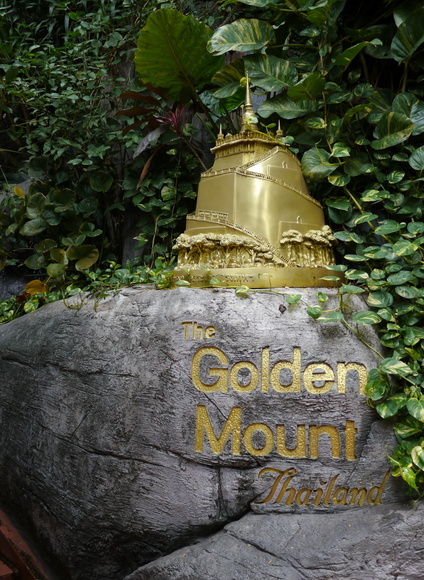 A steep, artificial hill and the highest terrain in the city, Golden Mount offers a nice view and also a nice breeze – much appreciated on a hot Bangkok day! View from the top of Golden Mount, looking southwest. 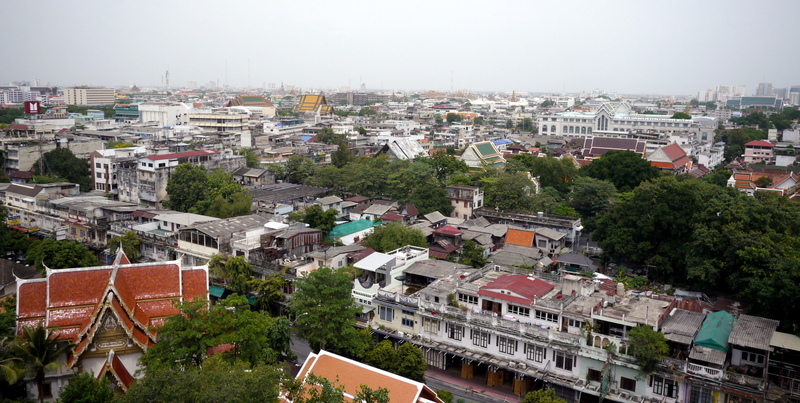 In the distance you can see the roofs of the Grand Palace. Across the canal from Wat Saket is Wat Ratchanaddaram. 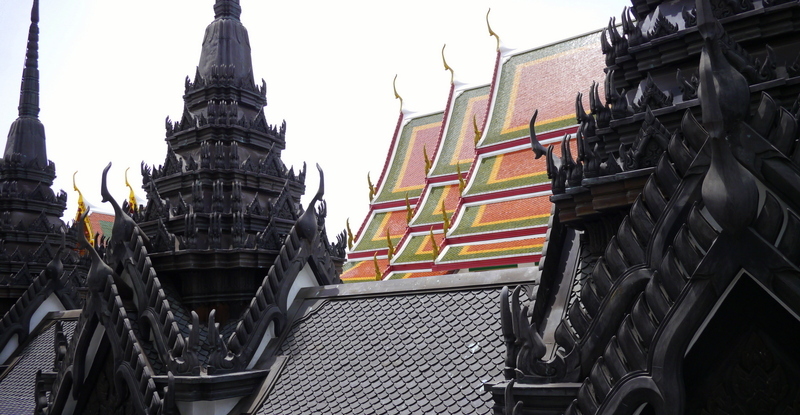 The most famous building on the temple grounds is Loha Prasat, commonly referred to as the Metal Palace. This is a unique building, built in a pyramid shape with 37 spires (signifying the 37 virtues towards enlightenment) and modeled on two other similar buildings, one in India and another in Sri Lanka. 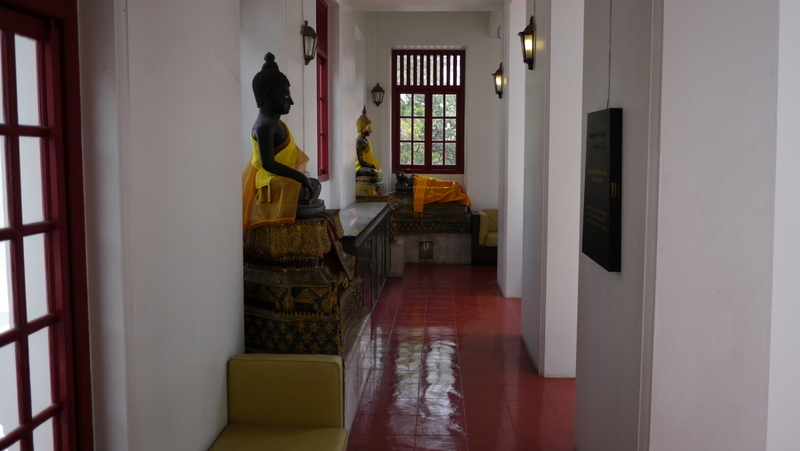 Loha Prasat is the last of the three in existence and is a UNESCO World Heritage site. The structure has recently undergone a full renovation and informative displays fill the hallways. The symmetrical layout allows for refreshing cross-ventilation and also a sense of surprise as you turn corners and see the architectural features of the structure framed in interesting ways. 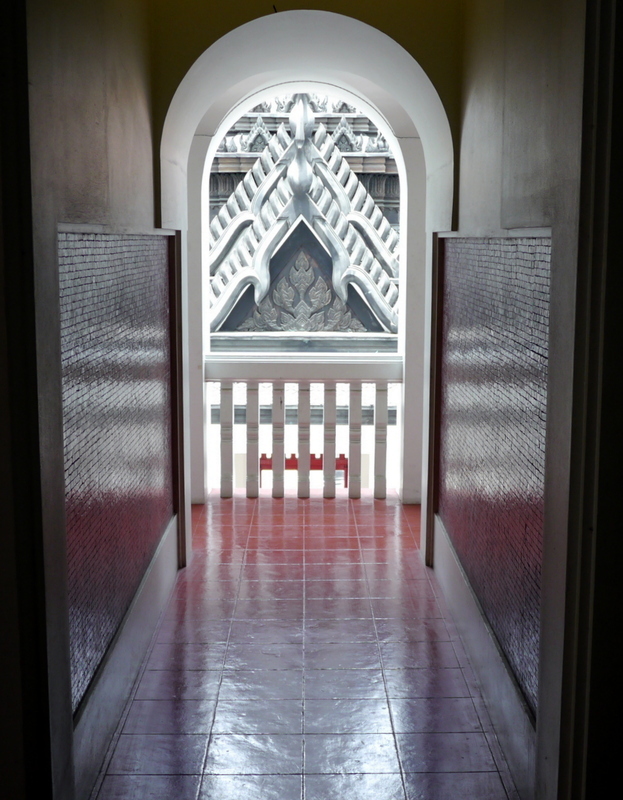 Loha Prasat has made its way onto my “must see in Bangkok” list, a list which I really need to update as I’m frequently asked for it. 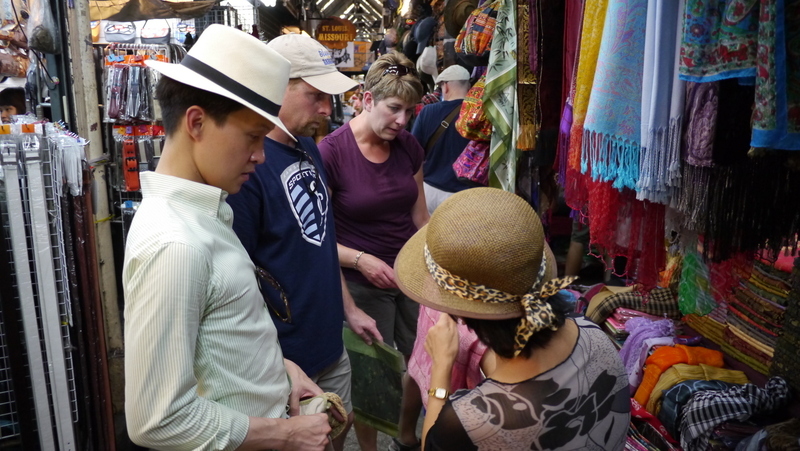 We made our requisite trip to the Chatuchak Weekend Market, where Jenn and Kevin hunted for gifts for friends and family members with Tawn’s assistance. We also visited one of Bangkok’s newest attractions, a nighttime market on the banks of the Chao Phraya River called Asiatique. 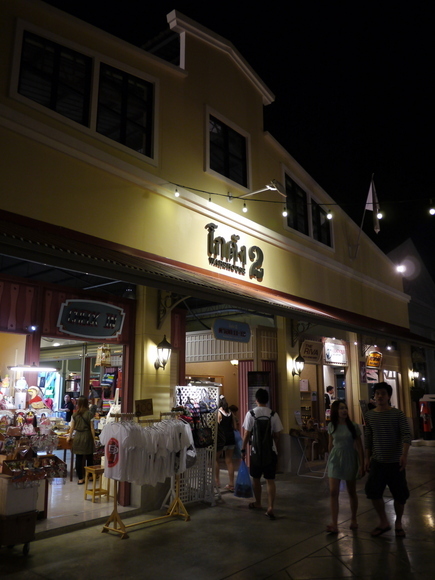 Essentially a replacement for the now-closed Lumphini Night Bazaar, Asiatique is reached by free shuttle boats and has a range of restaurants and shopping. The space, a series of converted warehouses, is fun to visit although I was not particularly impressed by the goods for sale. That said, I’m not a shopper so my view may be biased. 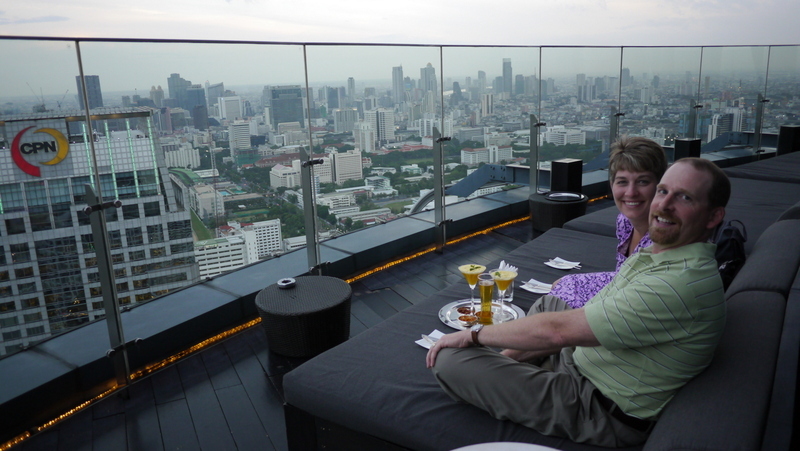 Near the end of the trip, we went for drinks around sunset at the top of the Centara Grand Hotel at Central World. Bangkok has no shortage of rooftop restaurants and bars (a large increase from the two or three that existed when I moved here) and the Centara offers one of the best views, being centrally located. This also makes it onto my “must see” list. 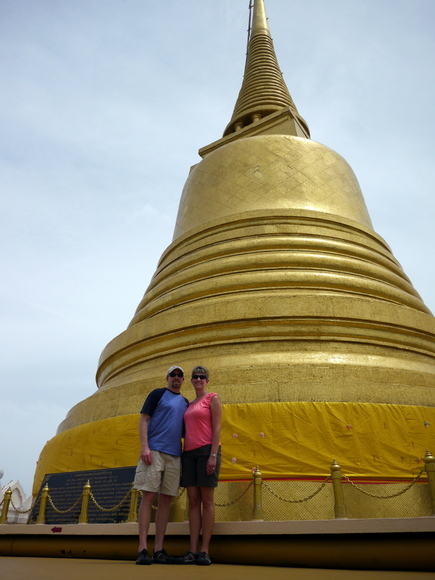 We made a side trip to Chachoengsao Province to visit Wat Sothonwararamworaviharn, also known as Wat Hong. 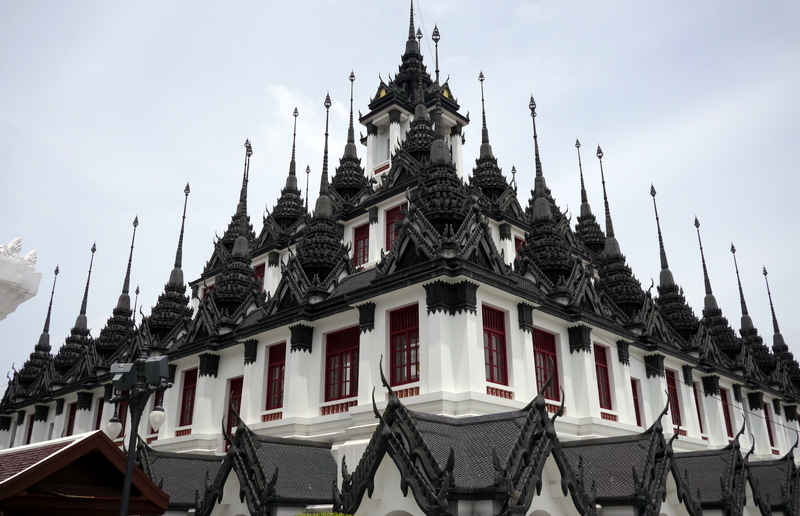 This beautiful temple is located on the banks of the Bang Pakong River and is the oldest temple in the province. 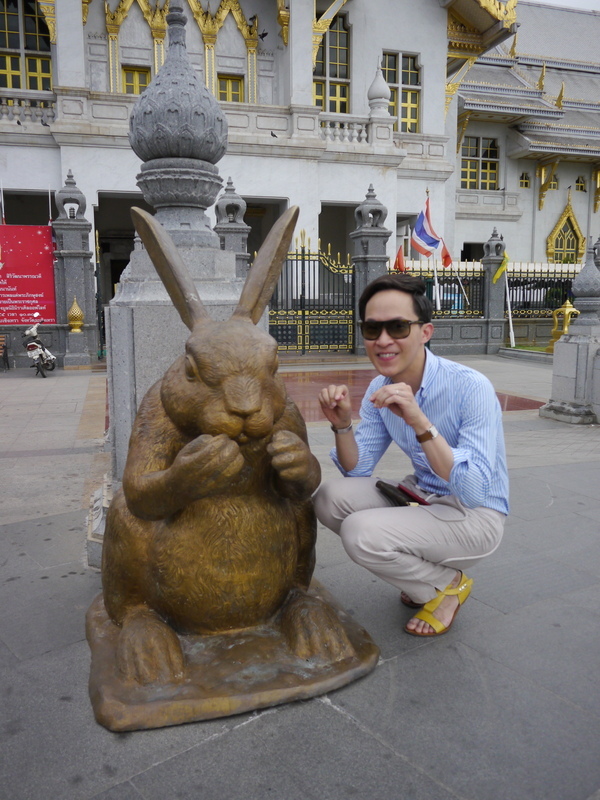 Tawn, who was born in the year of the rabbit, poses with an appropriate statue at the temple. After two weeks, I think Jenn and Kevin were ready to head back to Kansas City. Hopefully, they will return next year with their two daughters and my parents in tow! The afternoon that we departed San Francisco, our cousins from Salt Lake City flew in to see us. We had time for lunch at Chow restaurant on Church Street, right around the corner from where we were staying and where we used to live. Still one of our favorite restaurants. I didn’t take pictures of everything, but there are a few shots that turned out nicely and are worth sharing. Chow has been around since 1997 and its premise is simple: high-quality, healthy, affordable comfort food. 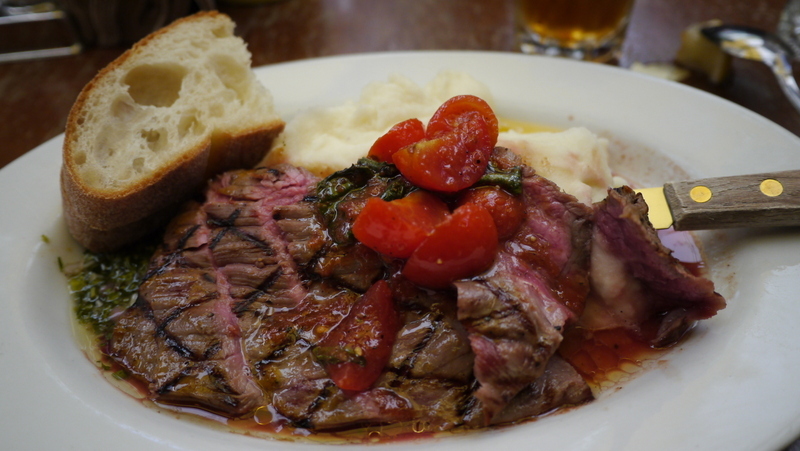 Its menu reflects the Italian and Asian immigrant heritage of San Francisco. Hangar steak, grilled to a perfect rare and sliced thin. 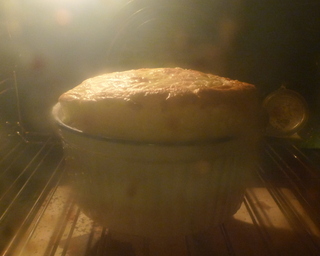 Served with mashed potatoes and a cherry tomato confit. 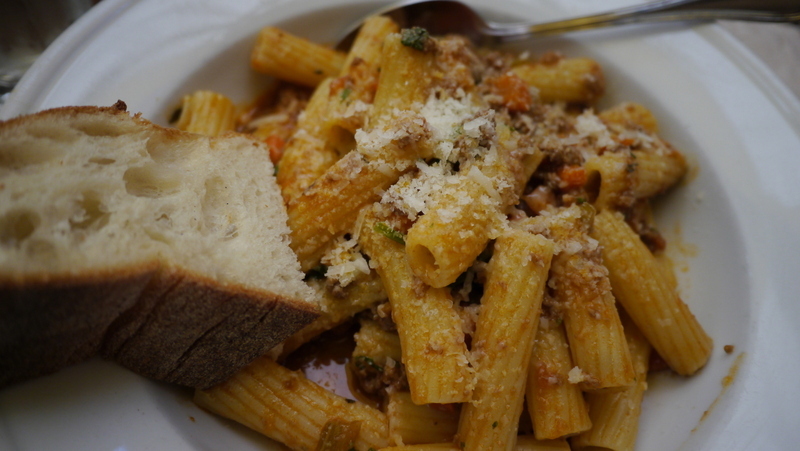 Rigatoni of spring lamb sugo. Simple, hearty, perfect for lunch before a long plane ride. 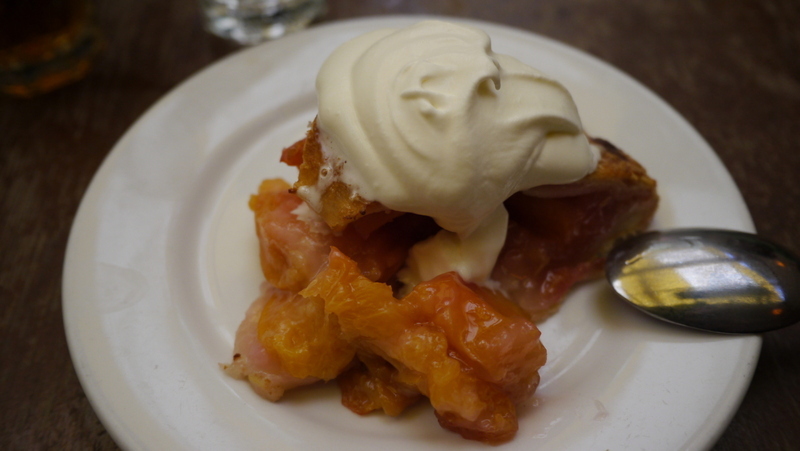 Home made peach pie with vanilla ice cream. Summer in a slice. 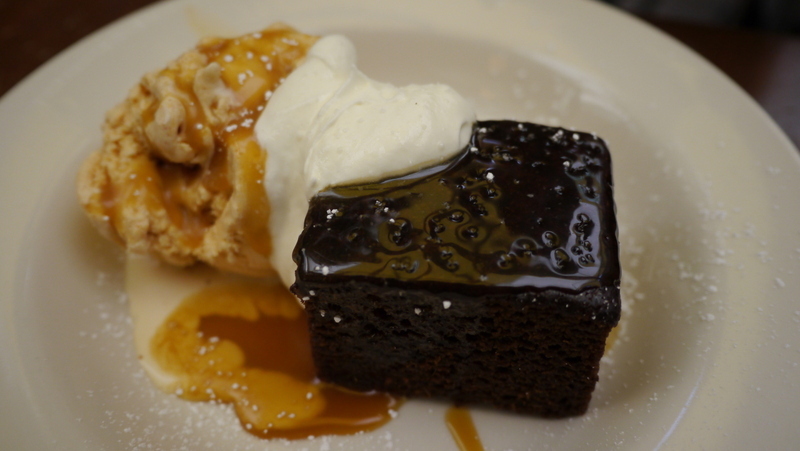 Classic menu item: ginger cake with pumpkin ice cream. Yum! My cousin Alex with her son Tommy. 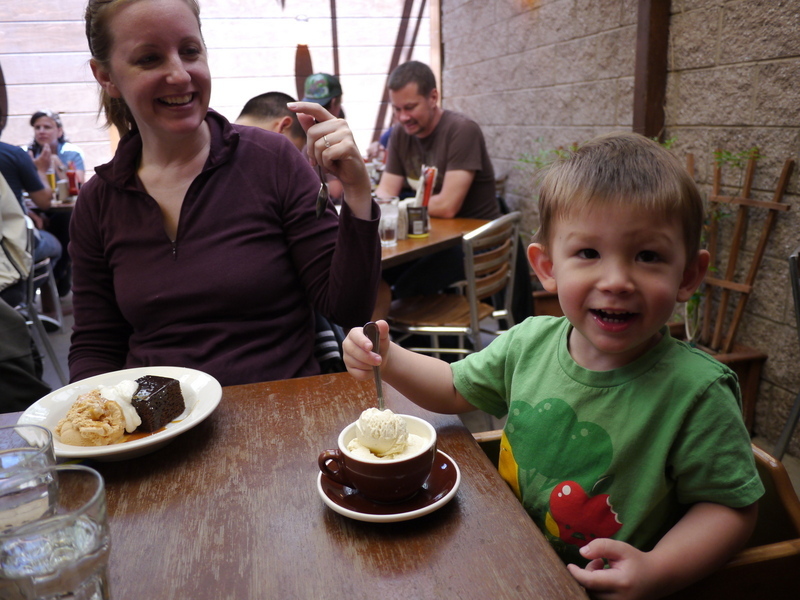 Tommy looks mighty happy about his suacerful of ice cream! 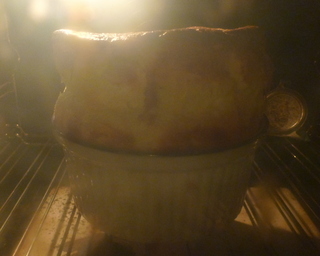 Inspired by yesterday’s entry about Cafe Jacqueline, last night I decided to try making a ham and cheese souffle for dinner. 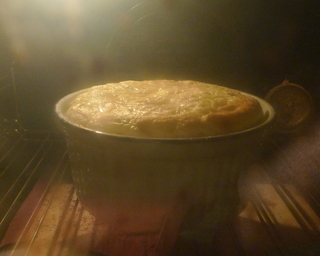 Very cool to watch how it rises during the 30-35 minutes of baking. 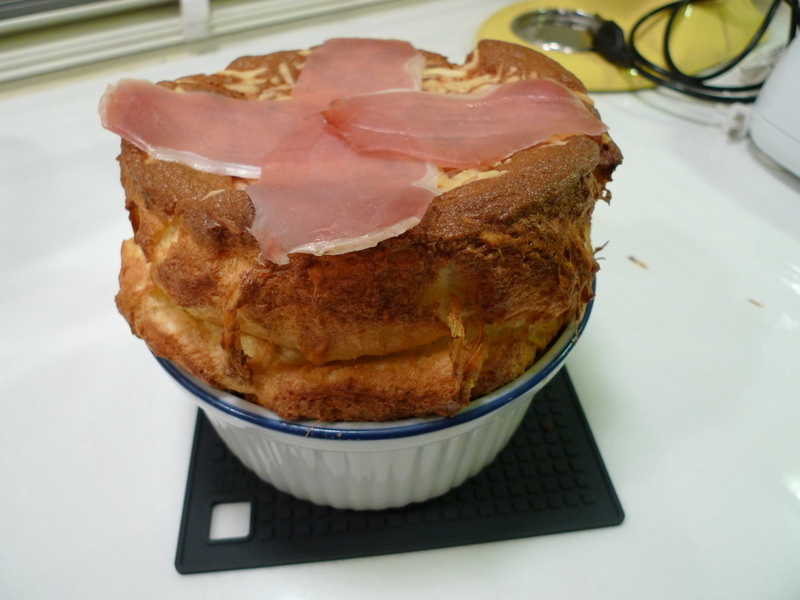 It turned out quite nicely, although could have used a bit more salt and pepper to season it.